Fundació ACSAR wants to make Europe, Spain and Catalonia a prime example of how to deal best with immigration, asylum and integration. The organization strives for a diverse society where equal rights are respected and cherished. Recently there has been much talk in Spain about a number of cases in which asylum was denied to LGBT asylum seekers. At the same time, there’s a regression in the civil rights of LGBTs in various countries, such as Russia and some African nations. Fundació ACSAR thinks these facts emphasize the importance of the possibility of seeking protection in Spain for people that are prosecuted because of their sexual orientation or gender identity. 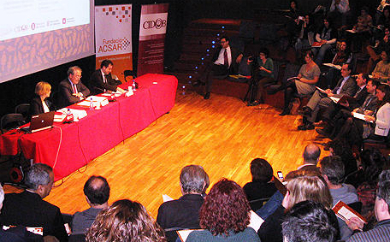 In November 2013, Fundació ACSAR organized a seminar about the right to asylum for LGBT asylum seekers not only in Spain, but within the whole of Europe. It wanted to increase awareness in Spanish and European institutions responsible for the application of the right to asylum. Furthermore ACSAR wanted to encourage them to incorporate the EU and the UN Refugee Agencies recommendations about the consideration of LGBT people to the right for asylum. The seminar was aimed at empowering the international LGBT community. It was a starting point for the search for partnerships between organizations working in the defence of LGBT human rights. It also hoped to increase the public visibility of the persecution being suffered by the LGBT community in many countries. Watch two videos about the seminar (the first is in English, the second in Spanish) below.